Have you noticed that your car does not run like it used to? Does it feel like you are getting fewer and fewer miles out of every tank? Worrying that your ride might be heading toward a premature grave? Before you retire old reliable for an expensive newer model, make sure your issue cannot be solved with an easy fix. One of the main causes of your cars stunted performance could be dirty fuel injectors. Fuel injectors are the valves that shoot gasoline into the engine, which in turn gets combusted and becomes the energy that (literally) drives you. If your fuel injectors are all clogged full of gunk, you will not be able to get the most out of your vehicle, and it will be your wallet that will feel it the most. That is why some good fuel injector cleaner can really make a huge difference in the life of your car. Once all that gunk is cleared out and the fuel can flow freely once more, your car will be running better than it has in a long time. This useful guide will help you determine which fuel injector cleaner is best for you, so that you can be out cruising the open road again in no time. 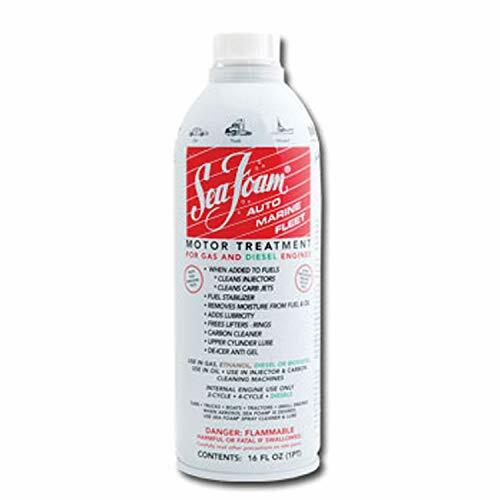 The Sea Foam sf-16 Motor Treatment fuel injector cleaner is one of the best all-around options available. This cleaner reduces emissions, improves power, and bumps up gas mileage. If you start using Sea Foam to clean your fuel injectors, you will quickly notice a serious uptick in your car’s performance and a major decline in money spent at the gas pump. Sea Foam is a versatile solution that works well for cleaning sludge and debris clogging your fuel injectors, and also helps destroy the gunk and sludge mucking up your oil lines. This cleaner is easy for anyone to use, and, best of all, Sea Foam is cheap. It costs less than other fuel injector cleaners that not only do not work as well but also only give you bottles one third as big. Add it all up, and it is clear that you cannot go wrong with using Sea Foam fuel injector cleaner. The Lucas 10003 Upper Cylinder Lubrication and Injector Cleaner is another great all around option. This big bottle is extremely cheap, giving you multiple uses for very little cost. On top of that, this cleaner also improves your fuel efficiency, which will save you even more money. This adds up to the ultimate choice of fuel injector cleaners for those who are just trying to save a couple bucks. Lucas 10003 can be used for a variety of things, as well. It works on oil and gas lines, and it works for both gas and diesel engines. Plus, it can be used to pass smog emission tests. No matter what kind of vehicle you have, Lucas can have a big impact on your vehicle’s performance and a small one on your bank account. The Red Line (60103) Complete Sl-1 Fuel System Cleaner is a great choice for people looking to make an immediate impact by cleaning their fuel injectors. This solution boasts a nearly perfect clean after just one use, and it is also safe to be used regularly again and again. So, if you are looking for something that you can use time and time again to clear your fuel injectors up, Red Line is a great choice for you. Red Line helps restore your engine’s power back to where it used to be before getting bogged down with all this gunk. However, even with all the cleaning there is still no discernable difference in gas mileage after use. But if you are mostly interested in returning some much needed power to your ride, Red Line is a great choice. 104+ OCTANE BOOST Fuel Injector Cleaner is a great option if you are looking to take your clean to the next level. Why stop at fuel injectors? This solution gets in and cleans the entire fuel system, so that gas can flow freely and your vehicle can operate almost at brand new. If you are looking to reduce your carbon footprint, 104+ does an excellent job of reducing emissions so you can feel less guilty every time you hop in your car and go for a ride. It also helps smooth out those rough rides, making your overall driving experience much more pleasant. However, you may want to stock up on 104+ because even though it may claim you only need one bottle to see a big difference, it usually takes two or more to create a truly noticeable effect. 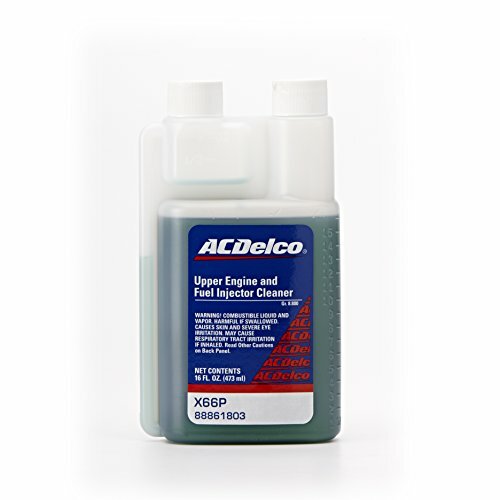 The ACDelco X66P Fuel Injector and Upper Engine Cleaner is a versatile choice that could help eliminate a number of issues in your vehicle. This cleaner works for both diesel and gas engines, doing a great job of smoothing out the ride for both types. And that obnoxious rattling noise will be silenced once you put some ACDelco in there. ACDelco has a very low volatile organic compound count, making it a safer option that will not seriously contaminate the air around you. However, if you are not at least a little knowledgeable about car mechanics, you might want to stay away from this option. You have to pop the hood to pour it in, so unless you know what is going on in there you should probably steer clear and pick a different fuel injector cleaner. Throttle Muscle TM8272 Super Concentrated Fuel Injector Cleaner can do a lot of very useful things for your vehicle. This cleaner has a super concentrated formula that boosts its effectiveness, improving both gas mileage and engine performance. It also helps smooth out starting, idling, and accelerating. On top of that, this formula will also decrease your vehicle’s emissions, which in turn helps save the planet. Throttle is only sold in small 6 fl oz. bottles, so you get very limited use out of one container. This is an even bigger issue since it usually requires a few uses before you will start to notice any changes. 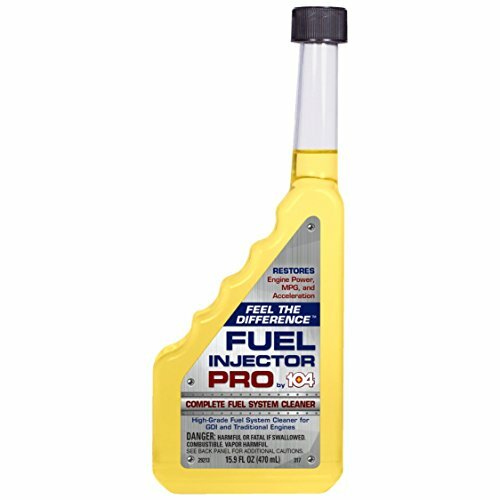 Even though you might have to buy in bulk to make this fuel injector cleaner effective, Throttle does do a great job of cleaning and restoring your engine when used regularly. 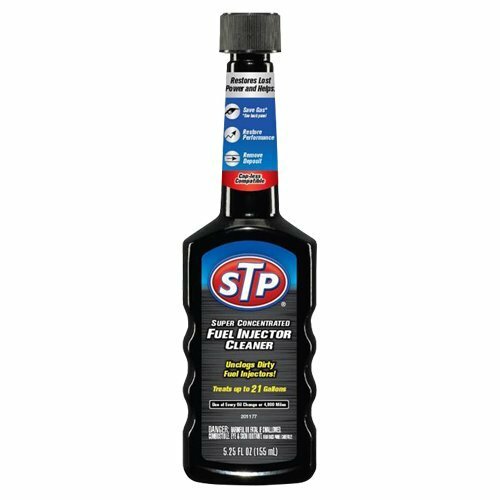 The STP Super Concentrated Fuel Injector Cleaner is another great choice to help get the most performance out of an older vehicle. This solution works with any type of gas system, even ones without caps. By destroying dangerous buildup in the injectors, STP improves fuel efficiency, power, and acceleration, making your old ride feel like new again. Unfortunately, STP is only for sale in small 5.25 fl oz. bottles. Plus, those bottles are not the most secure or reliable, often leaking contents all over the place. The packaging might be enough to discourage you, but the solution inside is the real deal when it comes to fuel injector cleaners. 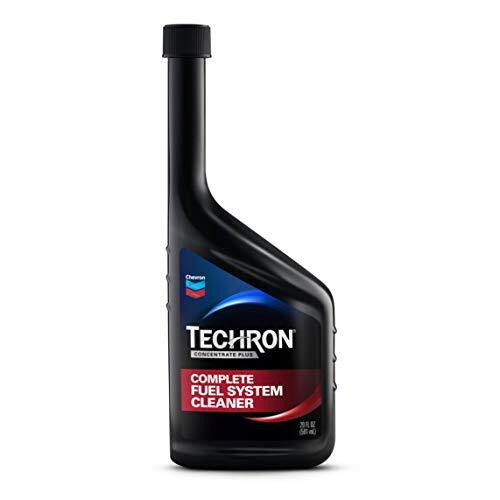 The Chevron 65740 Techron Concentrate Plus Fuel System Cleaner is a good bang for your buck buy. It comes in a 20 fl oz. bottle that is remarkably cheap compared to some of the other fuel injector cleaners out there. This solution goes the extra mile, deeply cleaning the entire fuel system while also protecting it against further buildup. It also improves gas mileage and helps to keep it more stable, so you will not have to worry about your fuel economy fluctuating wildly. Chevron takes multiple use before it starts making a noticeable impact, but at least it comes in a bigger bottle so you do not have to worry about restocking as much. The Schaeffer Manufacturing Co. 0137ULSW-004S Diesel Treat 2000 fuel injector cleaner is one of the best, if not the best, fuel injector cleaners around. So why is it not higher on the list? Because this magic formula is only to be used with diesel engines. Therefore, it just cannot be considered as useful overall. But that does not mean it is worthless. No, the Schaeffer Diesel Treat 2000 is chocked full of great stuff. It uses SynShield technology to create a sort of protective layer around the metal to help prevent future sludge buildup. 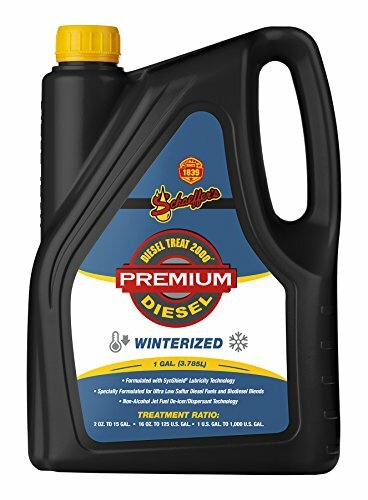 It is very effective in the winter, preventing your fuel lines from freezing. Also, it improves your car’s fuel economy up to 3%, saving you money in the long run. Plus, it comes in a gallon jug so you get plenty of uses from it. If you have a diesel engine, this is the fuel injector cleaner for you. Fuel injectors are the part of the car that sends the fuel into the engine, where it is burned up and converted into the energy used to power the car and get you from A to B. These injectors have little nozzles on them that spray the gasoline. This is wherein the problem lies. No matter how good the fuel you are using is, it is not one 100% pure. There are various particles in there floating around that do not contribute to powering your vehicle. These floating substances start to clog the fuel injector nozzles with sludge and gunk and all sorts of gross stuff. This in turn makes it harder to get fuel to the engine, making the engine less powerful and your gas mileage less efficient. It also makes acceleration more uneven, so that driving your car quickly becomes an unpleasant and even dangerous experience. Overall, this can cost you a lot of money and time. Fuel injector cleaners get into the fuel lines and clear away this buildup. Using them can improve engine performance, fuel efficiency, and just make your ride feel a whole lot smoother. That is why it is important to get the best fuel injector cleaner for your needs. When deciding between cleaners, they can focus on different aspects, like restoring lost engine power, or improving your fuel efficiency, or even reducing your emissions. You need to make sure that your fuel injector cleaner is able to do the job you bought it to do. You also need to consider a few other things when selecting a fuel injector cleaner. You need to make sure it matches up to the type of engine you have, diesel or gas. Some cleaners are also useful for cleaning other parts of your engine, which might be of use to you as well. Also, make sure you know how to use the fuel injector cleaner you get. Most are easy enough to use and just get poured into your gas tank when you fill up, but others require a detailed knowledge of your car’s inner workings. If you cannot figure out how to apply it, then it is of no use to you. We put our cars through a lot. They are with us pretty much everywhere we go. That is why it is important to take care of them so they can last for a long time in great working condition. If your vehicle is starting to slip in efficiency and performance, try using fuel injector cleaners to restore some of that lost luster. A little bit can go a long way, and regularly using a fuel injector cleaner can put years and miles back on the table. We expect so much from our cars. Make sure you take care of yours so that you can get every last mile out of it. Use this guide here to choose the best fuel injector cleaner for you, and restore your ride to its former glory.